My Dad has been on my mind more than usual lately. There was a family wedding a few weeks ago, and we all missed him and his two brothers who immigrated here to Canada from Belgium in the 1950s. They’ve all passed on now, and their absence never goes unremarked during family occasions. My cousins, brother and I remember them with funny stories (those three brothers were all quite the characters in their own right) and a few tears, and then get on with having a good time, knowing that Phil, George and Emiel are still with us. Besides, if they saw us acting maudlin they’d probably have something to say about that! One of the ways I pay tribute to my Dad, Phil, is through enjoying some of his favourite foods. Quirky to the North American sensibility, I relish mayonnaise with french fries, pickled herring (fastest way to get my kids to clear the room and get me some peace!) 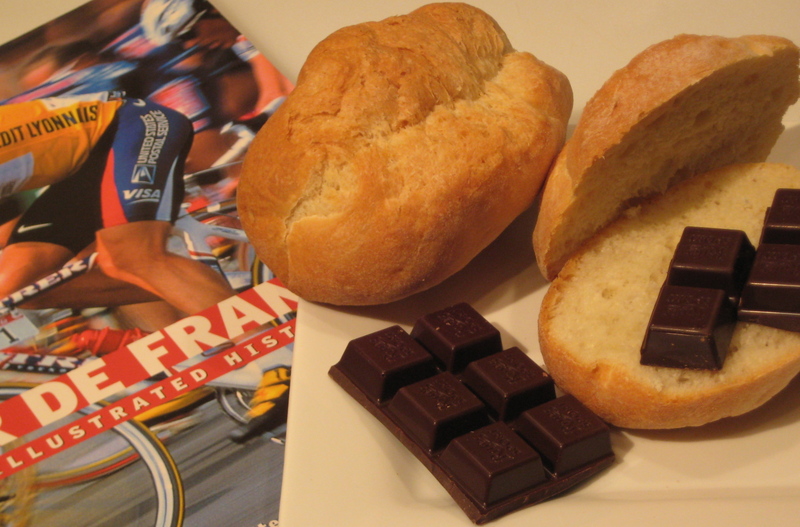 and this treat, bread with chocolate. A simple lunch, and so, so good in a European way. The last birthday gift I gave Dad, a bicycle racing enthusiast, nine years ago was this book about the Tour de France. It seems fitting to picture it with chocolate, since another of his major interests in life was to treat my children to a constant supply of chocolate and ice cream. In fact, Petje, as they call him, once brought so much chocolate back from a trip to Belgium that he broke the handle of his suitcase. How’s that for devotion? We love sharing these memories, like a warm hug. Bread. Chocolate. Memories of Dad. Keep writing, I love reading your postings! Diana. Thank you for your lovely comment, I’m glad you enjoy my posts. And, oh, the lack of those fathers of ours … felt so much more on the happy occasions. What a nice food tribute to your dad. 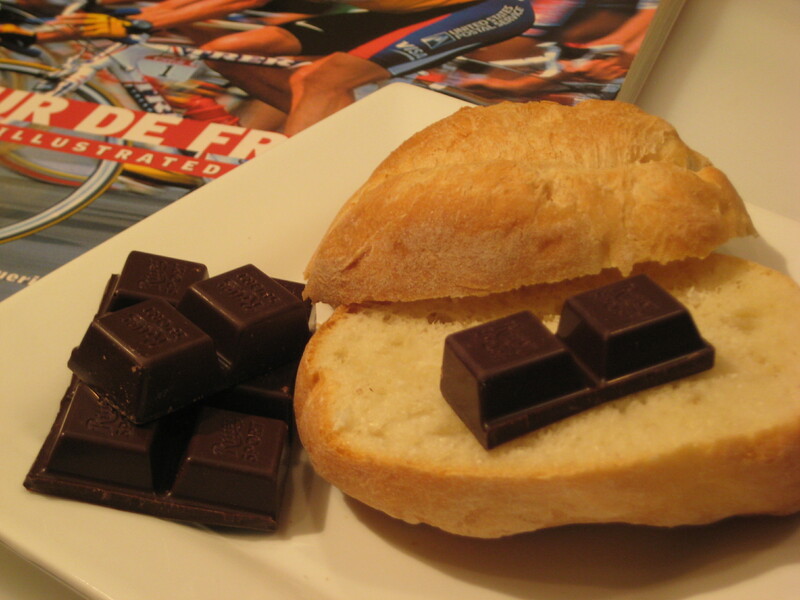 Just curious – does the chocolate get melted onto the bread, or left as-is? This isn’t something I would ever think to do, but it sounds interesting, I’m guessing it tastes like a pain au chocolat? Thank you, John. This goes to show how many memories are held in what we eat. Good call on the amount of chocolate … Dad wouldn’t have had that much with his bread! And, he would have buttered the roll too. I’m looking forward to reading about your Dad. As for mine, I’m sure if he were here he’d be pleased that I wrote about him, but I’m not sure that he’d show it! Oh, I forgot about the bologna sandwiches! How could I? 🙂 Petje adored you guys above all else. I’m so happy for the time you had with him, but sad that he left us too soon. He lives on though, in our memories and in each generation that follows. How he would have doted on your girls! A lovely tribute to your father…I know he must be smiling from above. Oh, thank you, that’s so sweet. I feel that way too. I do remember my grandma always had chocolates to hand in her old-fashioned pantry. As for my parents – well they are always on diets is seems so never any chocolate to be found!